For a variety of reasons, many governments considered the development of lines of a narrower gauge than that first used. Apart from the advantages of the narrower gauges in mountainous areas, these thoughts were stimulated by the realisation that to open up the vast and sparsely-populated country demanded rail systems able to be constructed and operated at a minimum cost. Queensland and Western Australia, with impoverished Treasuries and coming to railway development later, decided upon cheap 3 ft 6 in gauge government lines. South Australia built several secondary 3 ft 6 in gauge networks in the remoter parts of the colony to supplement its main line 5 ft 3in gauge system. New South Wales persisted doggedly with standard gauge railways in spite of many attempts by the advocates of lighter and narrow gauge railways to change this policy. To keep costs down the NSWGR built a number of standard-gauge lines with five-chain radius curves and 1 in 25 grades, - necessitating the use of small 0-6-0 tender locos on these lines, due to the very sharp curves. From 1899 until its closure in 1931, the NSWGR owned one 3 ft 6 in gauge railway - the Broken Hill to Tarrawingee Tramway, but they did not operate it. They entered into a contract with the Silverton Tramway Company to operate it on their behalf. The line was originally built by a private company, but when that company closed it in 1898 it was taken over by the NSWGR as a result of public pressure to keep it operating. All governments had a number of narrow gauge railways operated by a variety of instrumentalities, such as Public Works and Construction authorities, Forestry Departments, Water and Irrigation authorities, and even State quarries, sugar mills and brickworks. However, of particular interest are the four state government railway systems which operated narrow gauge railways of less than 3 ft 6 in gauge. 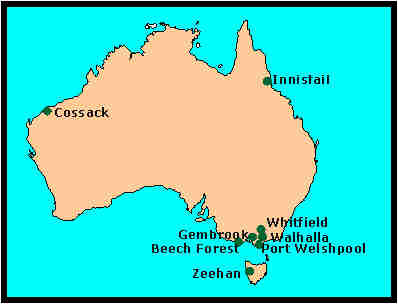 The mountainous west coast district of Tasmania developed as a mineral field following the discovery of tin at Mt.Bischoff in 1871. Mt Lyell, with its gold and copper, followed from 1886 while the Zeehan silver field developed from 1888. A number of privately-financed narrow gauge railways were built throughout the district, but at Zeehan there were not only private 2 ft gauge lines but also a major government line of the same gauge connecting with the 3 ft 6 in gauge line it had built from the port of Strahan. The North-East Dundas Tramway of the Tasmanian Government Railways was built from 1896-8 and was almost 18 miles in length from Zeehan to the zinc-lead ore loading point at Williamsford. This was a very rugged and challenging line to operate with a maximum gradient of 1 in 25 and a minimum radius curve of 99 ft in a very high rainfall area. Locomotives used included a pair of very powerful Sharp Stewart 0-4-2T locomotives (G class), an amazing Hagans 2-6-4-0T articulated locomotive (J class), and the first two Beyer-Garratt locomotives ever built, a pair of 0-4-0 + 0-4-0 locomotives (K class). Passenger as well as mineral traffic was a feature of the line's operation. The line was extended by another four miles in 1901 with the construction of the Comstock branch at Zeehan and there was also a 1 mile dual gauge section along the 3 ft 6 in gauge line to the Zeehan smelters. Unfortunately, the last government train ran in 1931. The Sharp Stewart locomotives were sold to a Queensland sugar mill but the articulated locomotives languished in the shed in Zeehan for a number of years. Fortunately, one of the K class was repatriated to the United Kingdom in 1947 and is expected to be used on the restored Welsh Highland Railway. In 1895, a colonial parliamentary committee recommended the adoption of 2 ft gauge for a number of government railways in areas that did not justify main line railway construction. In February 1898 the recommended gauge for these lines was changed to 2 ft 6 in. The first line constructed was the 30 mile Wangaratta to Whitfield line in the north-east of the colony, opened in 1899. It was followed in 1900 by the Upper Ferntree Gully to Gembrook line (just over 18 miles in length). This line was in the Dandenong Ranges immediately to the east of the colony's capital, Melbourne. The state of Victoria opened the 29 mile Colac to Beech Forest line in the Otway Ranges to the west of the capital in 1902. A 3 mile long horse-drawn line from Welshpool to Port Welshpool followed in 1905 on the South Gippsland coast in the east of the state. The 26-mile line from Moe to the mining town of Walhalla in Gippsland was opened in 1910 and a 14 mile extension to the Colac line from Beech Forest to Crowes was opened in the following year. Passenger and freight trains featured on these lines, in the early years at least, and the locomotive fleet was a series of powerful 2-6-2Ts. The two initial locomotives had been purchased from the Baldwin Locomotive Works in the USA, one a simple expansion type and one a Vauclain compound. One simple and one compound locomotive were then built at the railway workshops at Newport. The simple expansion locomotives were adjudged the most suitable for Victorian conditions, and a further thirteen were built from 1902 to 1915. Both the simple and compound locos became known as the NA class. 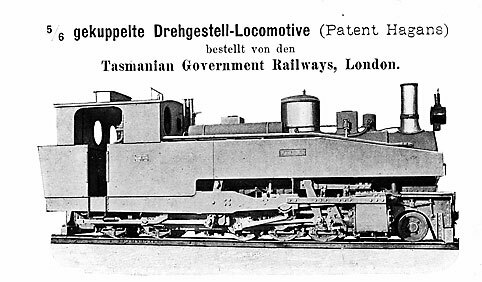 In 1926, a couple of 2-6-0+0-6-2 Beyer Garratts were ordered by Victorian Railways from Beyer Peacock for use on the taxing Beech Forest and Walhalla lines, where heavy loadings had led to the need to run frequent additional trains to clear the traffic. These powerful G class locomotives were used exclusively on these two lines. The Port Welshpool line remained a horse tramway until its official closure in 1941. The Wangaratta to Whitfield line closed in 1953. The Moe to Walhalla line ran up the spectacular Stringer's Creek Gorge as it neared its terminus, but the mines at Walhalla closed shortly after the railway arrived. In the period from 1944 it lost its passenger services and was cut back in stages to be completely closed in 1954. A restoration attempt at the Walhalla end during the 1970s was unsuccessful but since 1994 the Walhalla Goldfields Railway has gradually extended its tourist railway operations from Thomson up the gorge towards Walhalla. The last ten miles of the Colac to Crowes line was closed in 1955, losing its passenger service at the same time, and was closed completely in 1962. In the meantime, a number of very popular special passenger excursion trains had been run on the remaining part of the line from 1958, but preservation attempts in this remote part of the state were unsuccessful. The Upper Ferntree Gully to Gembrook line was closed in 1954 after being blocked by a landslide in August 1953.. The Upper Ferntree Gully to Belgrave section was used from December 1954 to February 1958 to run passenger excursion trains. From early in 1955 these were sponsored and organised by the Puffing Billy Preservation Society (PBPS). The Upper Ferntree Gully to Belgrave section was closed in February 1958 for conversion to a broad gauge suburban railway. The passenger excursion trains had been very successful and were the inspiration for the similar trains operated from Colac from 1959. The line from Belgrave towards Gembrook was revived progressively from 1962, by the Puffing Billy Preservation Society, in conjunction with the Victorian Railways. In 1977 ownership of the railway and rolling stock was transferred from the Victorian Railways to a new statutory authority, the Emerald Tourist Railway Board in which the Society has a significant role. Gembrook was reached once again in 1998. This is a very successful tourist railway in beautiful countryside very close to a capital city. "Puffing Billy", the Belgrave to Gembrook line, has six NA class 2-6-2T locomotives and one of the G class Garratts. Other locomotives acquired for main line operation in preservation days include one diesel from Tasmania and another from Queensland, both regauged from 3 ft 6 in. There is also a 2 ft gauge Garratt imported from South Africa, and a variety of industrial types including an operational "Climax" geared locomotive. The Walhalla Goldfields Railway operates a John Fowler 0-6-0DM locomotive regauged from 900 mm, and there are plans for steam traction to be introduced here also. The Queensland Government Railways became the owners and operators of a north Queensland 2 ft gauge railway network in 1914 when it took over the Geraldton Shire Tramway and Mourilyan sugar mill's line from the mill to Mourilyan Harbour. The Shire Tramway ran inland from Geraldton (now Innisfail) to Nerada with branches to South Johnstone and Kalbo, a total of 21 miles. The Harbour line ran from Mourilyan Mill to the deep water port at Mourilyan Harbour and was approximately 6 miles long. The acquisition was under the North Coast Railway Act, which provided for the purchase of certain local government lines to facilitate the completion of the Brisbane - Cairns railway route. After the two original sections were linked across the South Johnstone River, the Innisfail Tramway (as it was to become known) totalled 29 miles in length. The Shire Tramway had been developed to carry general produce (including sugar cane) and passengers, and shortly was to become very significant in transporting sugar cane to the government-financed South Johnstone Mill, which opened in 1916. The Mourilyan Harbour line had originally been built to bring machinery to the Mourilyan Mill site in 1883, and subsequently to carry raw sugar from the mill to the wharf. In the period from 1921 to 1924, the Innisfail Tramway became a vital link in the rail transport network of the state, with about 100,000 passengers carried each year between the southern terminus of the 3 ft 6 in gauge line from Cairns at Garradunga, and Mourilyan Harbour or Innisfail, using running powers negotiated over the metals of the Colonial Sugar Refining Company Ltd at Goondi Mill. Quieter days followed, but as passenger and general goods loadings declined, the haulage of cane to South Johnstone and Mourilyan mills, and of raw sugar from the mills to Mourilyan Harbour became the line's staple. New steam locomotives arrived and then in turn diesels of the types being used in sugar mill use. Sale of this most profitable part of the government railway network to the two mills in 1977 brought about a rationalisation of cane transport operations for the two mills, but led to the immediate cessation of sugar haulage by rail from South Johnstone. Sugar transport from Mourilyan Mill ceased in 1996. The two worn-out Shire Council John Fowler 0-6-0T locomotives had been replaced by similar machines until a total of four were in use by 1923. Shorter-lived were four second-hand locomotives: three Hunslet 4-6-0T locomotives from the War Department Light Railways and a Krauss 0-6-0T. Three John Fowler 0-6-2 tender locomotives were put into service in 1924-6 and were very successful, last running in 1962-3. Two Baguley 0-6-0DM locomotives from Railway, Mine & Plantation arrived in 1954 and were followed by seven Commonwealth Engineering 0-6-0DM machines from 1956 to 1975 (one second hand from the Aramac Shire Tramway and regauged from 3 ft 6 in). Even as late as 1975, the QR insisted on a mechanical gearbox rather than the torque converter by then in vogue among sugar mills. Some of the Com-Eng locomotives were fitted with control equipment for multiple-unit operation, and some bulk sugar wagons were fitted with air braking to enhance the safety of the heavier trains hauled. The airbraking and multiple-unit equipment was subsequently removed under mill ownership. The diesel locomotives went to South Johnstone and Mourilyan mills together with the track and most of the rolling stock. Some of the locomotives allocated to Mourilyan Mill were passed on to Moreton Mill, just north of Brisbane. One of the tender engines survived in a park long enough to be rescued for preservation, while of the diesels all apart from one are still in service, at South Johnstone, Mourilyan and Moreton Mills. In 1887 an 8½ mile long 2 ft gauge horse-hauled tramway connecting the port of Cossack with the town of Roebourne was opened. The line was owned and operated by the Western Australian Government Railways, and it possessed six passenger cars, twenty goods trucks, and six horses to provide motive power. In 1908 an additional five miles of track was laid to link the new port of Point Samson with the Cossack line about half a mile from Cossack. The WAGR were most reluctant operators of this line, for Cossack was over one thousand miles north of Perth, and completely isolated from any other WAGR line. The Government eventually heard their protests and transferred the line to the WA Public Works Department on 1 July 1909. This page is prepared and maintained for the LRRSA by Frank Stamford and copyright © by LRRSA. Last updated on 23 March 2009.